Stephanie Lowdermilk, manager of Englin's Fine Footwear is surprised and reacts to a $2000 check that was donated to cover her deductible on major damage sustained to her home during the Nov. 17 tornado. 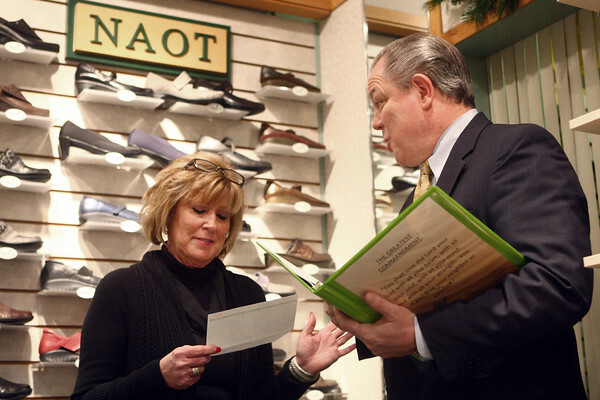 Tom Mosser, owner of Englin's Fine Footwear, presents her the check on Thursday afternoon. Naot Shoe Company, a brand carried in Englin's, has donated 150 shoes free of charge to those affected by the tornado.